Some women nest when they are pregnant by obsessively organizing the nursery until every onesie is folded just so and all the outfits are color coordinated and sorted by size, some scrub the house obsessively. I did a little of those, but mostly I cooked. And when I say I cooked, I mean I cooked! In the two weeks before Jackson arrived, I completely filled my freezer with everything from chili and cornbread, to pot pie, to muffins, to waffles, to cookies and hummus. I started with an empty freezer and when my nesting was over, I literally had to remove the ice basket to fit everything in. One of the recipes I made, 5 Ingredient No Bake Date Bars, from the blog “Oh She Glows,” barely made it to my due date. My family and I could not keep out of them. They are like crack, but healthy crack. In fact, they could probably cure drug addiction. Angela at Oh She Glows is a genius when it comes to making healthy vegan treats. I can’t wait for her cookbook to come out. These bars have no added sugar, only five ingredients and don’t even require turning on the oven. My favorite thing about them is that they are best eaten straight out of the freezer. 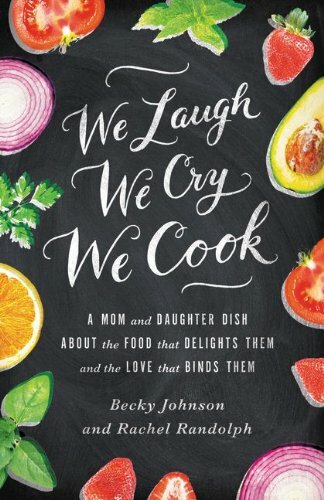 When Jackson arrived and I was a new nursing mother, I would suddenly be ravenous, and could hardly think straight until I had food in me again. These were the perfect fuel for my sudden hunger attacks, high in protein and fiber, they were filling and healthy, but felt indulgent. I’ve made different versions of the bars countless times now, but yesterday I tried a new combination that really rivaled it’s original counterpart. Instead of dates and almonds, I used dried apricots and toasted cashews. Wow! I don’t know which one I like more. I took them to the leader meeting for my MOPS (Mother’s of Preschoolers) group last night and several requested the recipe. So as promised, here you go ladies! The sweet tangy pureed apricots sandwiched between layers of rich salty cashews hits three of the five taste bud senses and also combines creamy, chewy, and crunchy textures. It’s satisfying on every level. 1. Spray a muffin tin (my preference) or 8×8 pan with non-stick cooking spray. 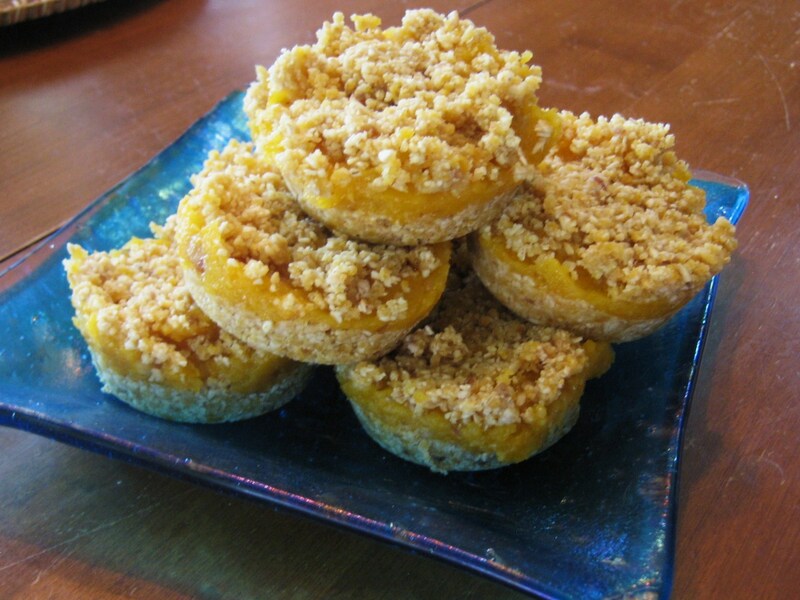 In a food processor, process cashews, salt, and oats until a fine crumble forms. Add apricots and process until crumbly again. Add coconut oil and process until sticky. Remove from processor, set aside 3/4 cup of the mixture for later, press remaining into cupcake molds or pan to form a crust. For muffin tins I use a tablespoon and put a heaping tablespoons into each mold, then use the back of the tablespoon to press down and smooth out the layer. 2. Process the apricots and 1/2 cup water in the food processor (I’ve found a smaller work bowl works better than a large one if you have a full sized food processor–in fact I just used my mini one for this step) until a paste forms, stopping to scrape down the sides and adding a little more water as needed (don’t exceed 1 cup). 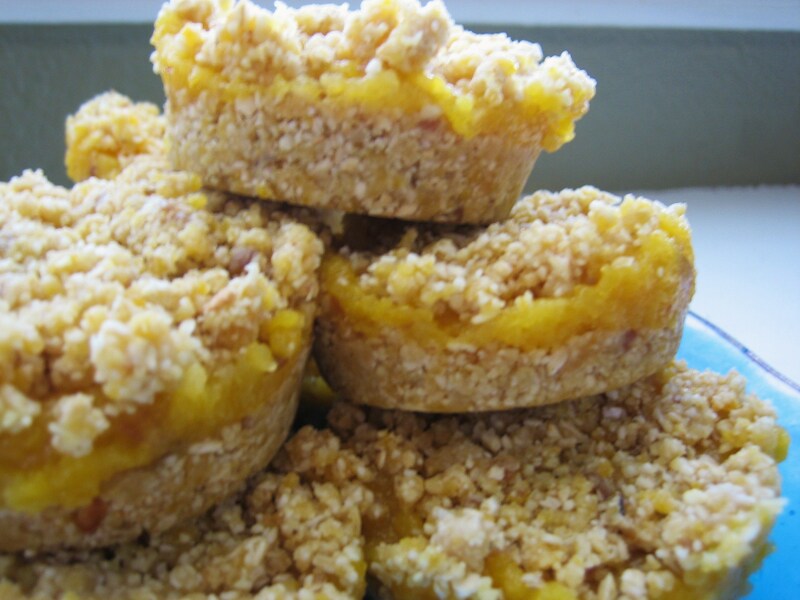 Scoop out the apricot mixture into the pan or evenly into the muffin tins and gently spread out to cover the crust. 3. Sprinkle on the reserved crust and gently press down into the apricot mixture, just so it sticks. Freeze for at least an hour or until firm. Cut squares or pop out of muffin molds and wrap individually with saran wrap. Store in freezer. Enjoy straight from the freezer or slightly thawed as a delicious, guilt-free treat! In the directions, it says to put apricots in the cashew mixture. Then it says to process the apricots with water. Are apricots suppose to be put in with the cashew mixture…if so how much of the apricots? Or do all the apricots go into the apricot filling? Never mind…I just realized there is a filling ingredient list. Must have scrolled down to fast to the directions and missed it. Great! Just got the kiddo down and should be around my phone/email for awhile, so let me know if you need any other help with it. It says Date filling but I see no dates called for? Oops! I thought I had corrected that. All fixed now!